If you are interested in buying stocks when they are cheap, then look no further than this pair of energy industry giants. It's not hard to find a cheap stock; there are companies careening toward bankruptcy all the time. The difficult thing is to find a cheap stock that's worth buying. Right now, there are two energy industry giants that are on solid financial ground but seem a little too unloved. If you are looking for incredibly cheap energy stocks, then take a gander at ExxonMobil Corporation (NYSE:XOM) and Enterprise Products Partners L.P. (NYSE:EPD). Here's what you need to know to get started. Exxon is one of the world's largest integrated energy companies. The stock's 4.3% yield is toward the high end of its historical range, suggesting a relatively cheap price. Adding to this view is the fact that its price to tangible book value has fallen nearly 40% over the past five years and hasn't been this low since roughly the 1990s. However, cheap doesn't mean good. But that's where Exxon shines. The company is financially strong, with long-term debt at just 10% of the capital structure. And its business is diversified across the upstream (oil drilling) and downstream (chemicals and refining) businesses, providing notable diversification to help soften the blow of volatile oil and natural gas prices. This business is built to survive hard times, like the deep oil downturn that started in mid-2014, or the oil bear market that's currently pushing oil prices lower. One of the biggest proofs of Exxon's strength comes in the form of a quarterly check. 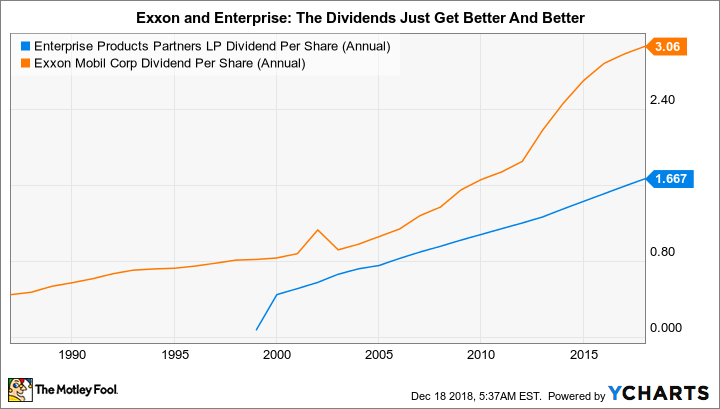 Exxon has increased its dividend every single year for 36 consecutive years. In fact, it continued to increase right through the difficult 2014 oil bear market while many peers were hitting the pause button or, worse, cutting their dividends. A key reason Exxon is cheap today is because its production has been falling for a couple of years. That's bad news to be sure, but management has laid out a plan to fix the issue. Always taking a slow and steady approach, the company is starting to show some progress along the path it outlined: Production increased sequentially between the second and third quarters. The problem is that Exxon's plan extends out to 2025, and investors aren't generally that patient. If you can think long term, though, financially strong Exxon is cheap today, and you can collect a generous dividend yield while you wait for it to execute on its turnaround plan. Enterprise Products Partners is one of the largest midstream companies in North America. The roughly 6.7% distribution yield the limited partnership offers today is near the highest levels of the last decade. And its price to enterprise value has fallen nearly 50% over the past five years. Although Enterprise is focused on the midstream segment of the energy industry, it owns one of the largest and most geographically diverse portfolios, including pipelines, processing, storage, and transportation assets. It even owns a fleet of tanker ships. The best part is that the vast majority of its business is fee-based. As a toll taker, Enterprise doesn't care about the price of oil and gas, just the demand for it. And right now, demand for energy infrastructure in the United States is high and growing. Leverage, meanwhile, is modest compared to peers, with debt to EBITDA (currently around 3.8 times) toward the low end of the industry. Like Exxon, Enterprise's strength comes through quarterly. It has increased its distribution every year for 21 consecutive years. As long as Enterprise can keep growing its asset base, it should be able to continue rewarding investors with distribution growth. Right now, though, it has dialed back distribution growth to the low single digits. Investors had become used to mid-single-digit growth. However, that change is temporary as Enterprise looks to shift toward a self-funding model that will make it an even safer investment option in the midstream space. Management expects the shift to be completed by the end of 2019, at which point it will be able to pick up the distribution growth pace again. In the meantime, you can collect a huge yield while you wait for this cheap partnership to get even better. 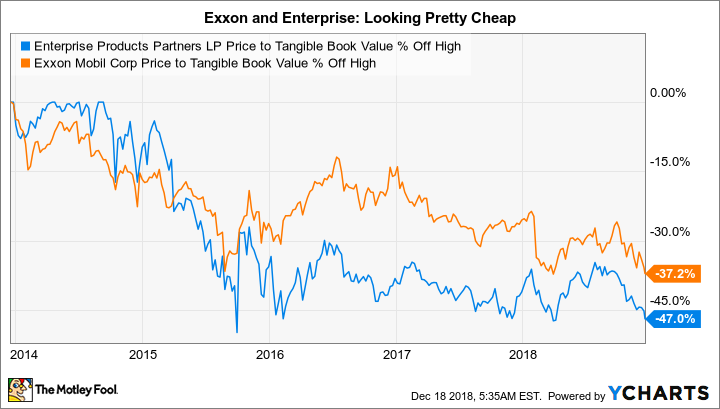 Although the cheap prices at which Exxon and Enterprise are trading today are the lead into the stocks right now, them being "cheap" isn't the only reason to buy them. Both are large, diversified, and financially strong companies. They have each proven that returning value to investors via dividends is important. And they are both working on a path to a better future. Impatient investors don't appear willing to wait for these plans to play out and have pushed the prices to attractive levels. But the relatively high yields should make it easy for those with a long-term mindset to stick around through the business transitions that are currently underway at Exxon and Enterprise.